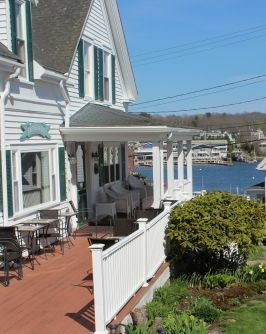 Comprised of both The Greenleaf Inn and The Admiral's Quarters, these beautifully picturesque and historic buildings run together as one, yet are only separated by the much admired (and coveted!) parking area. 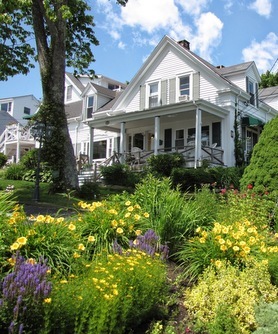 The Inns, both built in the early 1800's as sea captain's homes, set the standard for Maine Bed & Breakfasts as well as the larger inns, resorts and hotels. Perched upon a knoll at the edge of the waterfront in downtown Boothbay Harbor. 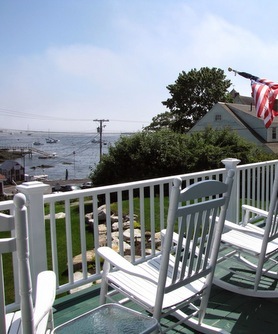 The Inn boast an extraordinary oceanfront location with panoramic views of the inner harbor, outer harbor and beyond. Whether it is lobster boats, schooners, harbor seals, sunrises, sunsets or the smell of the salty sea air, you will find these pure Midcoast Maine surroundings at The Inns at Greenleaf Lane. At our Inn you will find meticulous attention to detail from the manicured lawns and pristine gardens, to the immaculately clean and superbly appointed rooms complete with freshly ironed premium linens. Enjoy the amazing views from your own private deck, the Adirondacks on the front lawn, or many of our common balconies overlooking the water. Then wake up in the morning and join us for a fresh gourmet breakfast, made with love and seasonal Maine Ingredients. With the “Bed” comes the “Breakfast” and here at the Inns at Greenleaf Lane, we know how to do breakfast! We serve a full, gourmet breakfast each morning in the spacious Greenleaf Inn. Intimate private tables and outdoor café tables gaze out unto the water. Start your day off with your choice of coffee (or tea) from our Keurig system. The buffet, consisting of Fresh-squeezed Orange Juice, freshly baked danish & muffins, assorted breads with a variety of jams and spreads. Fresh Local Cheese, our Greenleaf Cereal Blend and more fresh items made daily. After enjoying all the buffet has to offer, we wil start you off with Fresh Fruit, Homemade Granola, and our greek Yogurt, followed by your sumptuous breakfast. Could it be a Wild Maine Blueberry stuffed French Toast with Lemon Curd and Blueberry Compote or perhaps, a Mushroom-crusted Quiche? Whatever is served, it will be the best Boothbay Harbor has to offer! 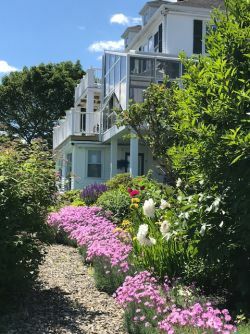 Midcoast Coastal Maine Locale-hiking nature trails, swimming beaches and coves, boating trips to the islands, bird watching, sailing, visiting museums, galleries, antiques shops, and crafts shops, and more.